Situated at the junction of Tiru and Karpu Danda, Paldor Peak (5860m) is situated in the southeast end of the Ganesh Himal (7422m). 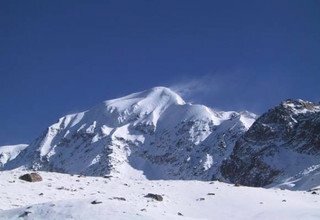 Paldor Peak climbing is one of the most famous peak climbing destinations in the Ganesh Himal range. It is one of least climbed mountains so its pristine nature has been maintained and offers sublime experience amid the wilderness of the Himalayas. Taking you through Tamang and Sherpa villages, the Paldor Peak Climbing is an excellent option to explore a less mainstream route. Paldor peak climbing is one of the most untouched Himalayan routes in the Ganesh Himal range. We will commence our trek to Paldor Peak with a scenic drive to Sybrubensi from Kathmandu. It is situated in the north-east of Kathmandu and nearly takes six hours to reach. We will encounter many rivers like the Langtang River and Bhotekoshi River leading us to the villages like Gatlang and Tangjet. The trek reaches its climax as we reach the pinnacle of the Paldor Peak (5860m). On reaching the summit we can enjoy the views of majestic mountains like Machhapuchhre (6697m) in the Annapurna range, high peaks of the Khumbu region along with the Shisapangma (8013m) and the brown hills of Tibet region. The climbing journey takes you through the fantasy setting of every travel enthusiast’s dreams. This trek rewards us with the untouched beauty of nature, diverse landscapes, beautiful and tranquil villages, and dense forests. This is one of the most adventurous treks in the Nepal Himalayan region offering us with the life experience. Swiss Family Treks and Expedition has established itself as one of the leading companies in travel and tourism in Nepal. With over 15 years of experience and passionate team, we have organized every travel package incorporating the needs of our clients. We offer excellent services throughout the journey which includes transportation, accommodation, and English-speaking guides. One of our staff members will be waiting for you at the airport. On your arrival, they will greet and transfer you to the hotel. Overnight at a 3-star hotel in Kathmandu. We will reserve this day for sightseeing in Kathmandu Valley. After having our breakfast, we will leave the hotel in a private car along with an experienced tour guide. We will visit several UNESCO listed world heritage sites in Kathmandu valley. We will visit the famous sacred Hindu temple, the Pashupatinath temple, Swayambhunath stupa, and Boudhanath stupa. These sites are famous to have inherited ancient religious practices, culture, and architecture. Overnight at a 3-star hotel in Kathmandu. We will leave our hotel in the early morning and drive to Sybrubensi. A scenic drive along the foothills to Sybrubensi will be an exciting start to our trekking journey. The trail mostly passes through the bank of Trishuli River with the magnificent views of Ganesh Himal (7422m), green fields and small valleys. We will cross few settlement areas like Dhunche and Betrawati on our way to Sybrubensi. Overnight at tented camp. Today’s path traverses along the bank of Chilime Khola initially. We will cross a suspension bridge over the Chilime Khola to the north bank and ascend until we will cross another suspension bridge to the south. The trail passes through Gholjong Sango and follows a water channel leading us to Tangjet. From here, we will ascend along the farmlands of rice, millet barley crossing many huge Mani walls, carved stones, and lotus Mandalas to our destination Gatlang. Overnight at tented camp. After having our breakfast we will continue along the trail passing through the Khumbu Danda (3,739m). From here our path will head towards the north along the crest and then ascends steeply to the west. Our walk will be along the forested landscapes of pine, fir, and rhododendron enjoying the beautiful views of Langtang and Annapurna ranges to a newly constructed road. Following the road for some time, we will make a steep climb ascending to Somdang. Overnight at tented camp. Today we will ascend to Lari from Somdang. The trail mostly passes through the rhododendron forests and continues along the tree, shrubs and by the open fields. We will clearly view the majestic Himalayas namely being Ganesh Himal (7422m), Manaslu (8163m) and others in the Annapurna range. The trail passes along the east side of Ganesh Himal (7422m) until Lari. It will almost take us five to six hours to reach Lari. From Lari, we can clearly see the Paldor Peak (5860m). Overnight at the tented camp. At the higher altitude, we need to acclimatize to the environment to make our further trek easier. We will do a short day hiking or take rest at Lari. We can enjoy the magnificent views of high mountains and the glaciers of this region. We can also stroll around the village to observe the lifestyle of the people. Overnight at the tented camp. We will cross a manganese mine and which will be the last tree-line at this height. We will steeply ascend along the rocky ridges towards the north-east direction along the moraines below the glaciers of Paldor Peak (5860m). The climb is almost steep along the ridge-line. On reaching the junction of East and west Paldor glacier, we will stay at the tented camp. Today, we will begin our trek along the steep moraine slopes to the beautiful campsites. The trail continues to climb along the boulder fields to a lake called Fang. Our campsite will be set just to the east of Fang, enjoying the beautiful view of towering peaks, the snowy glaciers, and lakes. We will practice using climbing gears for the remaining time under the guidance of our trek guide. Overnight at the tented camp. From our high camp, we will follow the trail leading the Paldor Glacier in the east. The trail is steep with loose rocks and hard snow along the trail. We must be careful to properly follow the instructions of the guide while summiting the peak. Continuing along the trail we will finally arrive at the peak. The stretching views of the mountains peaks like Machhapuchhre Himal (6997m), Shisapangma (8013m) and the brown hills of Tibet can be easily seen. After spending some time on the peak and admiring the beauty of nature, we will descend back to the Basecamp. We will choose a campsite set up our camp and then overnight at the tented camp. After enjoying the beautiful mountain views, we will retrace our path along the moraines to reach Somdang. The path will be steeply descending so we must be careful and watch our step. On crossing the manganese mine, we will encounter few green vegetation and waterfalls. On reaching Somdang, we will stay in a tented camp. The steeply descending trail leading to a road and will continue to the forested landscapes leading us to Khumpu Danda. We will again retrace the same path which we made the ascent to Somdang. The trail winding around the Khumpu Danda will take us to our destination, Gatlang Village. Enjoying the local culture and food, we will find a suitable place for camp set up. Overnight at the tented camp. After taking our breakfast, we will head toward the descending trail along the Bhotekoshi River to Thangbuche which lies just near to Chilime village. We will stop at Thangbuche for our lunch and we will see the Chilime hydropower dam. From here, the trail will ascend along the hanging bridge until reaching Tatopani. We can take a refreshment bath at the local hot springs believed to heal all pains and aches. Overnight at tented camp. Today, we will hike to Nagthali Danda which is a beautiful viewpoint for the high snow-capped mountains. The trail passes mostly through the forested landscapes to Brimdang village. We will stop there for our lunch and rest for a while. From there, we will ascend to the Nagthali Danda. Enjoying the panoramic views of the stretched mountains, we will descend back to Tatopani. Overnight at the tented camp. After having our breakfast, we will descend along the farmlands of rice, barley, and paddy to Tatopani. We will cross densely forested area and few tranquil villages before reaching Sybrubensi. Today marks the final day of our peak climbing journey in the Paldor periphery. We can admire the view of the mountains and beautiful landscapes of the Langtang region for a final time. Overnight at the tented camp. Day 17: Drive from Sybrubensi to Kathmandu by bus and transfer to Hotel. Today will be our last day of trekking. A scenic drive along the Trishuli River with the magnificent views of illustrious mountain peaks and lush vegetation will finally take us to Kathmandu. On reaching Kathmandu we will transfer you to the hotel and you can spend the remaining time shopping or resting. Overnight at a 3-star hotel in Kathmandu. After having breakfast we will drive you back to Tribhuvan International Airport for your scheduled flight. * Paldor Peak Permit and Garbage Deposit. greatly be happy to assist).